A few months ago I heard the song "Telstar" by The Tornadoes for the first time. One of the reasons I review music all over the map is because there is so much amazing stuff out there that I never knew about, such as a genre known as Space Age Pop. 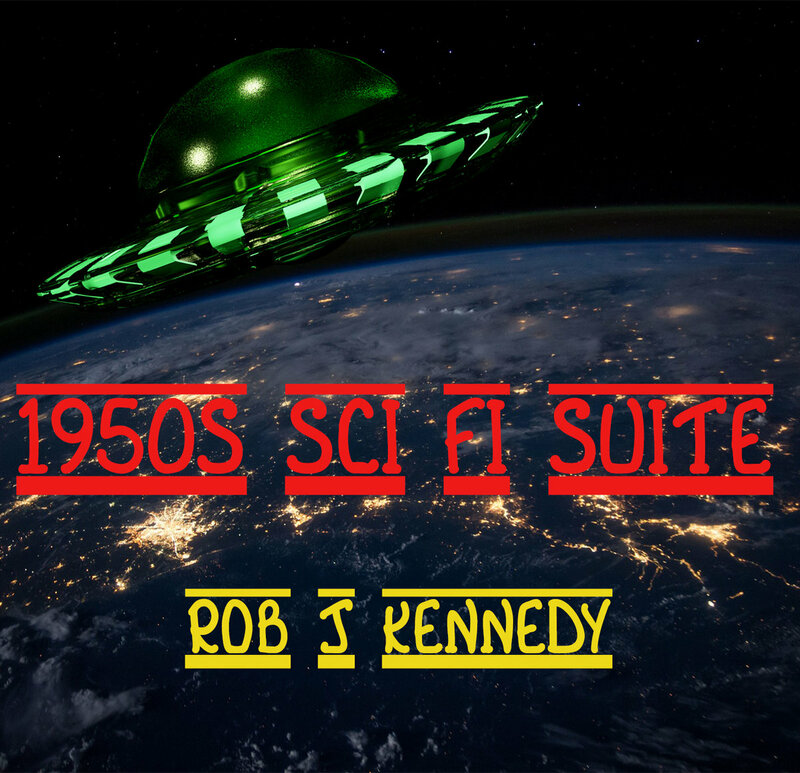 Needless to say I went youtube diving and found a bunch of cool tunes, so when Robert J Kennedy's 1950's Sci Fi Suite came onto our bandcamp radar earlier in Jazzy January we knew we wanted to cover it. Kennedy is a an Australian composer who has dreams of becoming a "movie music composer" and posts prolifically on bandcamp. The majority of these tunes are synth keyboard based but with lots of flourishes. The album does exactly what it sets out to do, pay homage to 1950's Sci Fi Films, if not that energetically; no big rocket chase or laser climax here, just drifting mellow sounds, rising and falling. Using strings, sounds and metallic bleeps and bloops the mood is set for each song. "A Woman? Are You Serious?" vacillates back and fourth while "I Had My Molecules Rearranged" just floats through the cosmos propelled by a light flute. The swelling and vibraphone work of "The Mad Scientists Brain Ticks Over" is a fun ride, but feels more contemporary worldly than retro 50's gazing. Things are a too much one note though as "The Brain That Slowly Ate The World" is dull and never lives up to it's title hype while "The Creeping Unknown" offers pleasant flute, but it is a path Kennedy has shown us a few times already. A bit more variety around the genre would have been appreciated as some of those early Sci Fi Films had a sense of humor about them that isn't represented here. Not being very knowledgeable of 50's Sci Fi movies (outside those featured on MST3K that is) the titles could mean something, thus the songs may match up to black and white scenes, which would be cool, but not necessary to the listening experience. The album could work as a score, background music, or a mellow headphone trip out to the stars, whatever is your pleasure.